As the Down & Dirty workshop tours the West Coast, from Seattle to San Diego, this is the question on everyone’s mind – and for a good reason. Drought, water restrictions, record high temperatures, and the looming threat that these conditions will continue threatens the productivity of farms and home gardens. Loss of snowpack and reservoir storage is forcing us to change how we think about the longevity of irrigated agriculture. Even in times of abundance, water plays a critical role in how our gardens grow, particularly in the dry summers of the western states. In part, this is because our plants need water to grow and thrive. But water is also critical for the living soil to stay active and abundant, the true foundation of healthy gardens and a living planet. So what do we do for the living soil when faced with water shortages and drought? Luckily, the steps we take to grow healthy living soils are the same steps we take to mitigate and even help our gardens thrive during dry conditions. This is because soil health practices increase soil organic matter, which enlarges soil water storage and availability, making our soils, and the soil life within them, more drought-resistant. In fact, scientists find that this effect on soil water drives many of the production benefits associated with soil health practices, such as no-till and improved grazing and crop rotations. Organic matter makes soils drought resistant in a couple of ways. First of all, understand that the soil is a water tank. When rain or irrigation comes, this tank recharges with water that becomes available during the drier days, weeks, and even months ahead. Organic matter essentially turns the soil into a sponge that captures and holds water, so that soils can retain some moisture even in excessively dry conditions. Organic matter itself looks a lot like a sponge, with water-absorbing pores making up much up its bulk. Studies have found that by increasing soil organic matter by 1%, soils can hold an additional 1.5 quarts of water per cubic foot. If you think about it, that’s a lot of extra water for plants and soil bugs to use. With this sponge effect, soils remain moist longer, and even in the dry periods between irrigations, living soil microbes can stay active and abundant. The second way organic matter affects soil water is by increasing the amount of water the soil can capture to refill its reservoir. The rains may come, but to replenish the soil, this rainwater must infiltrate and percolate into the ground. If water pools at the soil surface and runs off into to ditches and gutters, then it doesn’t recharge the soil, with our gardens suffering the effects of drought earlier the next spring. Organic mulch on the soil surface slows rainwater to increase capture, while spongy and light soil organic matter improves the ease with which water can filter into the soil. Finally, organic mulch, as soil shade, prevents precious soil water loss by evaporation. Knowing that water is essential, both for plant and for soil, what do we do when faced restrictions? How do we keep our soils healthy when we may not have enough water to grow our gardens? I like to think of this as a two-tiered response. First there are the emergency actions we can take when the crisis catches us off-guard. When imminent threats are over, there are actions we can take, as part of an overall soil health plan, to drought-proof our soils in the long-term. If water crisis hits us unprepared, we likely have to rapidly change what and how we grow. Neighbors pulling up plants or covering yards with plastic and gravel over the last year has become a common sight. Although this extreme response may alleviate the sight of dried and dead plants and the need for landscape and garden water, it also eliminates the living soil, making a bad situation worse. A living soil actually has the ability to mitigate drought effects, and keeping soil life as healthy as possible is essential for gardening in the future and improving the drought resilience of neighborhoods and communities as a whole. For instance, living plants grown in living soils shade and cool neighborhoods to actually capture water from the air and prevent evaporation. If you do find that you need to stop growing when caught off-guard by the drought, do everything possible to keep the living soil sheltered and fed. If getting rid of dead and dying plants, cut them off at the base to leave roots intact. Even when dead, they provide juicy soil food and microbial habitat. Cover fallow areas with organic mulch, which will improve aesthetics while still feeding the soil, reducing evaporation, and increasing infiltration when rains do come. Incorporate compost or other organic amendments (including the dead plants you cut down) into the soil before mulching. Composting in place by sheet mulching garden beds and vertical composting around trees, provides innovative methods to add and maximize the effects of compost materials. If the crisis convinces you that your lawn has got to go, don’t rip it out. Instead smother it with wet cardboard topped with a 2-4 inch layer of organic mulch, such as wood chips. If truly water limited, use an ultra low-tech greywater system to collect water in buckets from the bath or kitchen to soak the cardboard. When using this technique, the mulch becomes organic soil food and the existing living soil is left undisturbed. When hit by the drought, you may even find that you can grow more than you think. Although food gardens generally need a good amount of water, some simple strategies can keep you in backyard produce. In times of drought, keep the food garden small and selective, growing only what your household will eat. Select what you grow carefully, and avoid crops with high water needs like brassicas and other cool-season crops. To get the most out of the little water you have, choose high yielders, like eggplants, squash, beans, chard, mustard, tomatoes, and beans. Because crops need water from planting through harvest, short-season varieties, with less days to maturity, will also reduce overall water needs. When you do plant the food garden, use strategies to stretch a little water a lot further. Planting in blocks rather than rows more effectively covers the soil to conserve moisture. Starting seeds in flats also reduces water needs. Just like in the rest of your drought-resistant yard, organic mulch and strategic use of shade reduces evaporation to conserve moisture. As many find out the hard way, the best time to deal with a drought is before it happens. In addition to its many other benefits for the living soil, organic matter is the best way to drought-proof your garden and landscape (For more about the role of organic matter in making soils more resilient world-wide, check out the FAO’s 2005 publication). Build healthy soils by growing natural gardens and landscapes that include plants adapted to the local climate and environment. Native plants in the west generally have low summer water needs, in addition to low overall fertilizer requirements. Many other ornamentals, borrowed from arid or Mediterranean climates throughout the world, also make good additions to the drought-proof garden. How you plant can also reduce overall water needs. 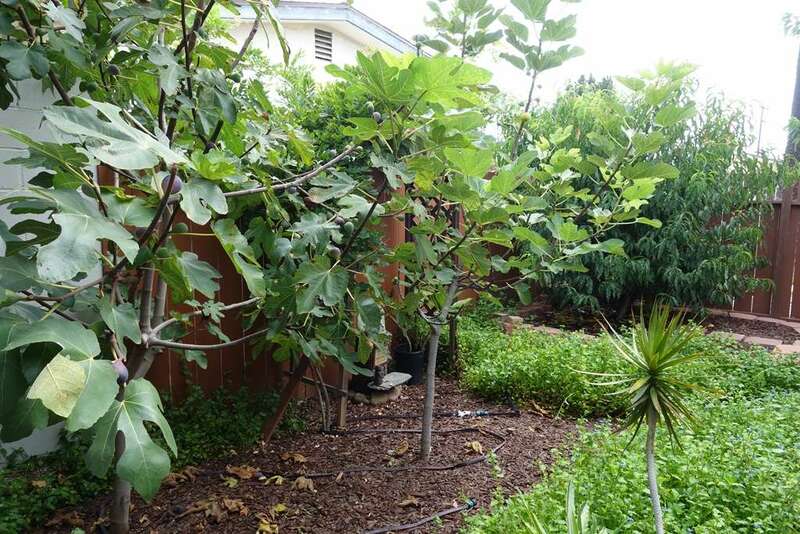 When planting for dry conditions, space shrubs and trees a little farther apart. Reduce water competition from weeds by using microsprinklers or drip irrigation directly on the plants you want to grow. Dry farming, a traditional technique gaining popularity as dry conditions continue, provides an alternative for growing food without irrigation. With this method planting is timed and spaced to utilize the natural soil reservoir. Without watering, plants rely on deep roots that follow water to greater depths as the dry season progresses. Trees and shrubs can also be kept alive using a similar technique by applying long deep irrigation several weeks apart in the spring and early summer. This replenishes deep soil water and provides a reservoir for thirsty roots in the drought of late summer. For a good crop, however, fruit trees do need regular water through harvest. Drought-proofing the garden by supporting the living soil doesn’t only apply to those of us facing water shortages. Feeding and sheltering life within the soil creates farms, gardens, cities, and landscapes that are resilient to changing conditions and environmental stress, in whatever form this takes. Whether extreme weather conditions, urbanization, our resource shortages, the resilience of the living soil, in the face of a changing world, will decide the resilience of our future.